Miss Chicago. 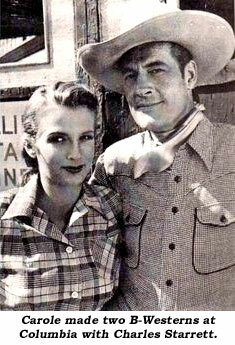 Earl Carroll showgirl. Restraunteur. Travel agency owner. Registered miniature horse breeder and trainer. Actress. 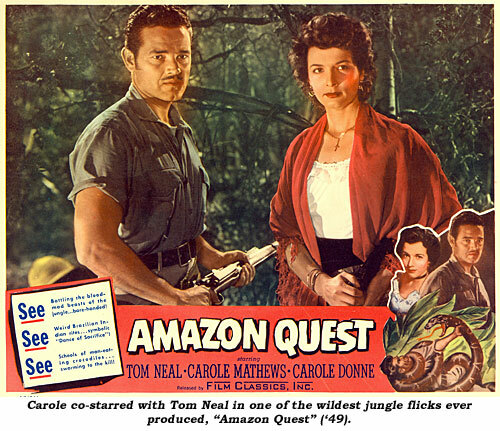 From humble beginnings as Jean Deifel on September 13, 1920, in Montgomery, Illinois (a suburb of Aurora), Carole Mathews did it all and traveled around the world with her accomplishments. But how different it all would have been if she’d followed her first aspirations—to become a nun. “The first thing I did was ‘The Girl In the Case’ ('44) for Columbia. I was put under contract to Columbia after I did that. 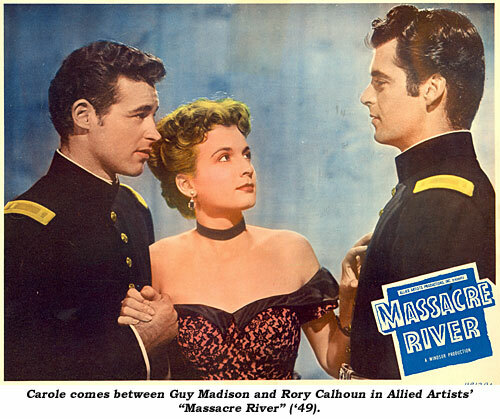 Max Arno, the talent person at Columbia was the one that decided to put me under contract.” Good roles in “The Missing Juror” (‘44), “She’s A Sweetheart” (‘44), “Swing In the Saddle” (‘44) and “I Love A Mystery” (‘45), based on the popular radio series, followed. 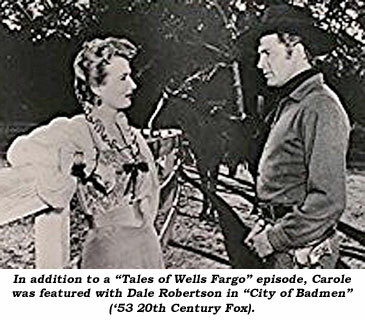 Although that role in “Whispering Smith” didn’t pan out, Paramount did use Carole’s talents in a couple of other films including “The Great Gatsby” (1949) with Alan Ladd. “Remember, I’m 5'7" and he was shorter. He stood on a box and I wore tennis shoes." 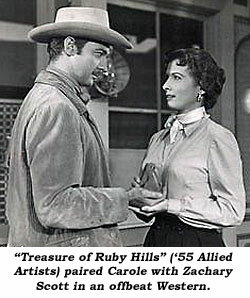 Like most actresses, Carole moved into the burgeoning new world of television in the early ‘50s. 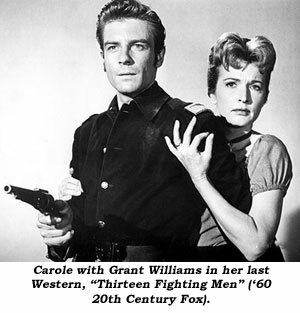 “I rode an elephant on ‘The Cisco Kid’ in 1952.” In the early days of live television, Carole says, “Most of the movie actors were scared of TV because it was like live theatre. 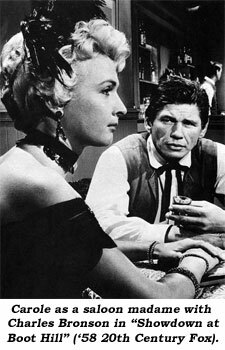 But I took to live theatre like a duck to water and really enjoyed live television.” She worked on “G. E. Theatre”, “Playhouse 90”, “Kraft Theatre” and others. 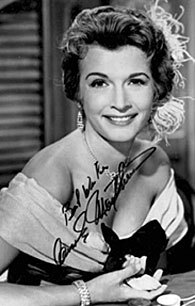 However, Carole did leave us at 94 on November 6, 2014 in Murrieta, CA. 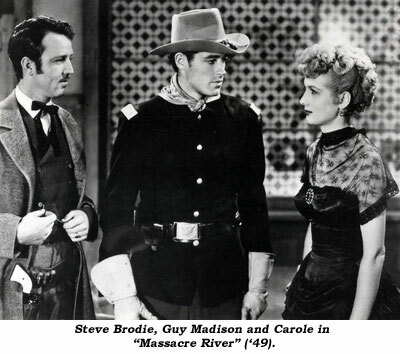 Movies: Swing In the Saddle (1944 Columbia)—Big Boy Williams; Blazing the Western Trail (1945 Columbia)—Charles Starrett; Outlaws of the Rockies (1945 Columbia)—Charles Starrett; Sing Me A Song of Texas (1945 Columbia)—Tom Tyler; Massacre River (1949 Allied Artists)—Guy Madison/Rory Calhoun; City of Bad Men (1953 20th Century Fox)—Dale Robertson; Treasure of Ruby Hills (1955 Allied Artists)—Zachary Scott; Showdown at Boot Hill (1958 20th Century Fox)—Charles Bronson; 13 Fighting Men (1960 20th Century Fox)—Grant Williams. 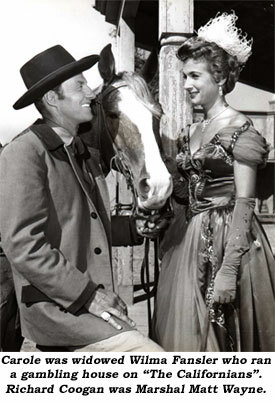 Television: Wild Bill Hickok: The Slocum Family (1951); Wild Bill Hickok: Blacksmith Story (1952); Cisco Kid: Pancho and the Pachyderm (1952); Cisco Kid: Dutchman’s Flat (1952); Jim Bowie: The General’s Disgrace (1957); Trackdown: The Farrand Story (1958); Tales of Wells Fargo: The Pickpocket (1958); Man Without A Gun: Lady From Laramie (1958); Zane Grey Theatre: This Man Must Die (1958); The Texan: No Tears For the Dead (1958); Gray Ghost: Greenback Raid (1958); The Californians: series regular (1958-1959); Northwest Passage: The Deserter (1959); Rough Riders: Lesson in Violence (1959); Death Valley Days: A Bullet For the D.A. 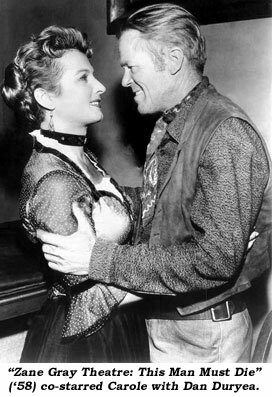 (1961); Rawhide: Incident at the Odyssey (1964).